The wading pool is perfect for the younger set, complete with toys and spraying fountains. Save the sandwich fixings in the fridge for another day and indulge poolside. Condos are angled to maximize your views over all 490 feet of pristine beachfront. Located directly on Fort Walton Beach. Kids will love the children's playground. Float along the lazy river. Waterscape Condominiums by Wyndham Vacation Rentals is located directly on Fort Walton Beach near some of the best attractions in Destin. The U-shaped building projects the condos out towards the beach, maximizing the stunning ocean views. In the center are three beautifully-designed swimming pools with rock waterfalls and a winding lazy river. The children’s pool with toys and fountains offers nonstop entertainment for the little ones. When it’s time for lunch, have a family cookout thanks to the BBQ grills and trellis-covered picnic tables or dine at the on-site tiki bar & grill. After lunch, let the kids hang out at the seasonal kids club or the arcade-style game room while you get your cardio on at the well-equipped fitness center. The little ones will have a blast on the children’s playground, and they’ll run off all of their extra energy just in time for their nap. Individually decorate one- to two-bedroom condos sleep four to eight guests and feature floor-to-ceiling glass doors and windows allowing you to make the most of the gorgeous views. Publix is just over a mile away, bring the family along to pick up groceries for your full kitchen. Or take a night off from cooking dinner; you’re walking distance to local restaurants including Old Bay Steamer and High Tide Restaurant & Oyster Bar. Cable TVs with DVD players provide in-suite entertainment. Have the kids pack movies from home, or surf through the channels until you find a show that everyone can agree on. One-bedrooms have in-suite washer/dryers if you feel like doing a load or two. Take a short stroll along the beach to Gulfarium Marine Adventure Park, it’s one of the world’s oldest marine animal parks, with up-close views of sharks and rays, along with must-do animal encounters. Animal encounters include dolphins, alligators, harbor seals, and penguins. Big Kahuna’s Water and Adventure Park features over forty attractions including pools, slides, and water play areas for the kids. The hammerhead features two curving slides. The kowabunga racer is a four-lane slide, challenge the kids to a race. The monkey river slide features twists and three-hundred-sixty-degree turns. Kids slides include piranha, blue mambo, Tahiti twister, and hydro max. If you’ve always wanted to try skydiving but don’t feel like jumping out of a plane, try the sky coaster. You’ll fly one-hundred-feet in the air at sixty miles-per-hour, giving you the feeling of skydiving. - Front desk is open 9:00 AM-5:00 PM daily. Guests who plan to arrive outside of front desk hours must use the after-hours phone located by the front door of the lobby to receive lockbox codes. Guests must return to the office the next day by noon to complete check-in. Guests are advised to bring beach towels, as the provided towels cannot be removed from the condominiums. The individual making the reservation must be 25 years of age or older and must occupy the rental property the entire term of the reservation. Singles under 25 years of age are prohibited unless accompanied by a parent or legal guardian. With its smaller condo resorts, Fort Walton Beach makes for a calm vacation away from the crowds. 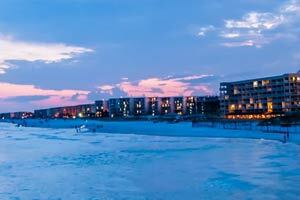 Almost all resorts in the area are located on the string-like Okaloosa Island.